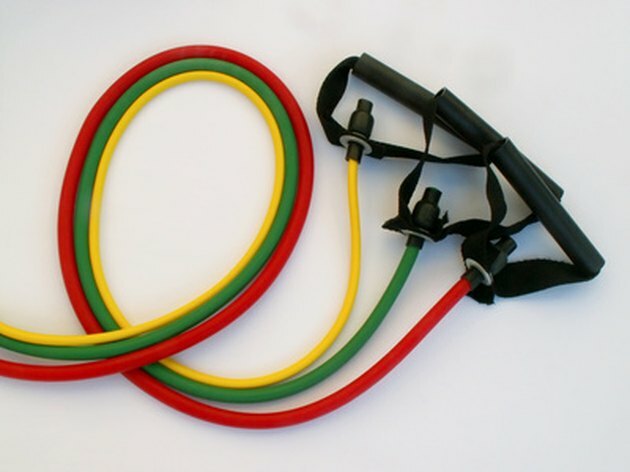 What Is the Difference in Colored Resistance Bands? Chelsea Hanson began writing professionally in 2009. She is a personal trainer and running coach in Ann Arbor, Michigan, who has written for the website AnnArbor and worked in the health and fitness fields since 2002. Hanson has a Bachelor of Arts in English from the University of Michigan and a Master of Arts in psychology from Michigan School of Professional Psychology. Resistance bands are used to help tone and strengthen the entire body. They are inexpensive, ranging from $6 to $20, and don't take up much space, so they can be used at home and when traveling. However, the different colors and strengths of the bands do not correspond to specific weights, unlike dumbbells and other strength training tools. The yellow bands are classified as light resistance. This means that they are very stretchy, and it takes little effort to pull against them and stretch them out. Light resistance bands are used for working areas such as the shoulders and shins, where you don't need much resistance to feel the muscle working. Red resistance bands are medium to heavy resistance. They have a higher level of tension than green or yellow bands and are harder to stretch. Red bands are suitable for muscle groups that are larger, such as the legs, chest and back, or for individuals who have been building muscle strength. Blue resistance bands are heavy resistance. These are much more stiff than red, green or yellow and do not provide as much stretch. Blue bands are for those who are very strong, or for those larger muscle groups, such as the legs, chest and back. These are also the bands to use when working out with someone else--when two people pull against a band. Black resistance bands have the most resistance. These are the hardest bands to stretch and pull. Like blue bands, black bands are used for the large muscle groups, such as the legs, or when working with others. Some sets of bands come in all black and the level of resistance is not based on color in these sets.